Swami Santhiprasad Indian Spiritual Yoga Master and Yoga Guru | School of Santhi Yoga Teacher Training Kerala, South India. International Yoga Teacher Certification. Authorized Institution by the Indian Government. 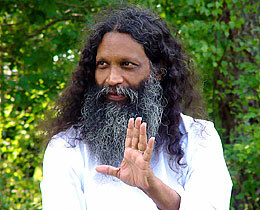 Spiritual Yoga Master, Yoga Guru and founder of School of Santhi Yoga School in Kerala, South India. which was closely connected to great spiritual Yoga Masters like Thycaud Ayyavu Swami, Chattampi Swamikal and Narayana Guru. was very close to Chattampi Swamikal. During Santhiprasad’s childhood his father spent many days with Swami. The family members, influenced by Chattampi Swamikal, maintained an atmosphere which facilitated discussions on spirituality and art, and the tradition continues there. Santhiprasad is an exponent of Indian spirituality, living in South India and in Sweden, Europe with his wife and two children. His father was Purushothaman and mother Sarojam. His grandfather Padmanabhan Bhagavathar was a renowned Yogi, musician and a physician and had Thycaud Ayyavu Swami as his mentor. One day the renowned Poojappura Gopala Swamikal told Purushothaman that a child is going to be born for him with star Bharani and he will fulfill what his father could not achieve! A year and a half later, he got a son exactly on Bharani star and that son was Santhiprasad. deeply interested in spirituality and very fascinated in the life stories of great spiritual Masters such as Swami Rama, Swami Vivekananda, Shri Chattambi Swamikal, Shri Ramana Maharishi, Shri Aurobindo and Shri Ramakrishna. and Indian Spirituality has been a serious lifelong learning starting when he was 5 years old. he was always curious to know the secrets of the universe and was constantly asking questions about the stars, moon, sun, galaxies, universe etc. into Siva Raja Yoga by his father who owed it from his father as a part of the family tradition. in Thycaud Nallathambi Lower Primary School. After higher secondary, he went to the University and studied in Mahatma Gandhi College in Trivandrum. He took his Bachelor's degree in Science. got his bachelor degree in law and became a lawyer. He was later employed in the Kerala State Legislative Assembly. During one period in his life, he was also writing, directing and staging plays highlighting the importance of conservation of nature and the up keep of human values. interested in wise men and Masters. 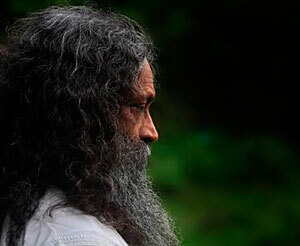 During his long spiritual search and many pilgrimages in India he came across many remarkable people and met many known and unknown Yoga Masters such as Maharishi Mahesh Yogi, Osho, Madhavan Pillai Swami, Parama Sivam, Guru Vasuki, Ganga Das, Narayana Swami, Swami Chidanada, Ramananda, Krishna Adiga and many others. In 1967 at age 19 Santhiprasad started teaching others in Yoga Asanas. learned the basics of Kundalini Yoga. from Madhavan Pillai Swamikal in 1977. "Swami was quite ordinary in his ways and we remained awake the whole night. He was talking about Pranic Spandans (Pulsations), Spandanopanishad and its significance in the spiritual evolution of a seeker. By sunrise, I went along with him. From that moment onwards I have never felt the need for another Master and I have stopped hunting for Spiritual Masters." In 1978 Santhiprasad started to teach others in Kundalini Yoga and Siva Raja Yoga. In 1982 Santhiprasad founded the spiritual organization Viswa Santhi Mission together with Raja Yogi Raja Atma Ram and in 1984 Centre for Conservation of Humanity together with his colleagues. a long vacation from his office at the Kerala State Legislative Assembly for doing a film based on the search of a youth, which in turn had led him to devote his full attention in spirituality. in his life. During this period, he was exploring into the causes of human suffering. In his intense inquiry, he has understood the causes and reasons for the psychological suffering of man. the problems of conflict, its causes and reasons that are rooted in concepts, believes and ideals. the games that are played by the mind for the upkeep of images created by the ego. During this period, he could distinguish between dreams and reality. of formulation of his philosophy. He has experienced the grace of Nature and became confident to be free. The cleansing process started years before within him and came to a culmination. Santhiprasad started to live an ordinary life unbiased by spiritual prejudices. and guidance of Bhaskara Pillai Swamikal, Santhiprasad formulated his own system of spiritual practice and Yoga Counseling. into the essence of Samkhya philosophy, Kundalini Yoga, Swara Yoga, Raja Yoga and Jnana Yoga and delineated his own system of Yoga therapy. his Indian spiritual Yoga School, School of Santhi, in Trivandrum, Kerala, South India. The same year his devotees in Italy started School of Santhi Italy and a year later his swedish devotees started School of Santhi Sweden. • Initiated in Mantra Yoga by his father Shri Purushothaman. • Learned Chanting from Shrimati, Lekshmi Kalyani, Grandmother, wife of Siva Raja Yogi Padmanabha Bhagavathar. • Started practicing Hatha Yoga as child. • Learned Patanjali Yoga Sutra as teenager. • Learned the basics of Kundalini Yoga as teenager. Maharishi's Institute of Creative Intelligence. • Studied Nature cure from Shri Ganesha Sharma. • Met Bhagvan Rajaneesh (Osho) in Pune Ashram. • Studied Nature cure system from Swamy Ramakrishna. • Studied Hatha Yoga and Swara Yoga from Guru Vasuky. • Studied Hatha Yoga from Ramananda Saraswathi of Kolloor. • Met Bhaskara Pillai Swamikal of Kowdiar and learned the secret of Spandan. • Initiated in meditation by Bhaskara Pillai Swamikal of Kowdiar. • Initiated in Kundalini Yoga by Balakrishna Pillai Swamikal. • Initiated in Tantric Sadhanas by Sri Krishna Adiga, Chief Priest of Kolloor Mookambika Temple.